What are home movies? What do they mean to us? Join film scholar and University of Maryland Adjunct Professor Dr. Caitlin McGrath to discuss this often-overlooked cultural art form. Join documentary film consultant and filmmaker Sam Hampton as he screens and leads discussion of The Mama Sherpas, a documentary-in-progress about midwifery by filmmaker Brigid Maher. The audience will help Maher by critiquing her film project. 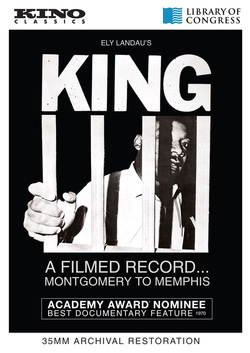 KING: A FILMED RECORD…MONTGOMERY TO MEMPHIS. This powerful work – screened in theaters for one night only in 1970, then virtually forgotten for more than 40 years – documents Dr. Martin Luther King, Jr.’s 1950’s and 1960’s struggle for civil rights against fierce southern opposition. It uses only newsreel and other primary material, unvarnished and un-retouched, covering the period from the 1955 Montgomery, Alabama bus boycott to his 1968 assassination in Memphis, Tennessee. Considered by critics one of the finest documentaries ever made.